Teaching Kids to be Good Losers? Ok, I admit it. I hate losing. I hate losing even more when I know i don’t have a chance to win. I have played hockey since I was in preschool and I continue to play to this day and I have always tried to play at my level or slightly higher. If I found myself in a game in which there was absolutely no chance of winning, I often disengaged and made a joke about the game (picture me and some buddies from high school playing in a 3 on 3 tourney against a bunch of ex-pro’s… it happened and it wasn’t pretty). So this is why I REALLY struggle with all the articles and posts going around that say “we need to teach kids to lose” and “we need to have our kids in highly competitive environments so they are ready for the real world“; I also struggle with the ones that state “all competition is bad for kids“. What do these statements even mean? They are surface level comments that often end there and do not allow us to go deeper into the discussion around learning. I think much of what we do falls in the middle and this dichotomy of all ‘competition vs no competition’ misses the point of what we are really trying to do: teach skills and build confidence and resiliency. When we state, “we need to teach kids to lose”, we make a huge assumption of what “losing” means and that our kids live in a world in which they never lose. Kids lose every day. Some kids come to school have had losses before they enter the doorways. If they lost the battle to have a mother and father… if they lost the battle to have a breakfast… if they lost the battle to have a good friend… if they lost the battle to be a “typical” child (whatever that means)… and yet, they still come to our school with a smile on their faces – are we supposed to teach them to be better LOSERS? What we really need to be talking about is the need to foster a growth mindset (Dweck), develop self-confidence, teach resilience, and help our kids understand what to do when they set a goal and we do not achieve it. (feel free to insert the buzzword “grit” anywhere here). Teach about a growth mindset – that intelligence and skill levels are not fixed… that humans are malleable and can learn any skill with purposeful practice. Provide a safe environment for taking risks. Don’t catch them when they fall but provide a smaller fall and guide them on how to respond when they fall. Check out Sheila Stewart’s excellent post on this. Help our kids to set personal goals that are focused on growth and do not depend on beating someone else. We cannot control what others do… if we win because we defeat someone with less skill level, is this a success? “Get them on a winning streak” (Tom Schimmer). Provide enough teaching, guidance, and practice so that kids can achieve small victories. Many of our kids have lost in school for a number of years and therefore, have no confidence and become disengaged. By “over preparing them” (Schimmer) and creating authentic victories based on personal goals, we can increase confidence. Embrace their strengths and support the deficits. Every child can be successful at something so find out skills in which our kids have confidence (or are interested in) and key on those strengths and use this as a platform to change the trajectory of their learning. Meet them where they are. Back up to where our kids can have success (or move forward so they can be challenged). As Kanter writes, “Expectations about the likelihood of eventual success determines the amount of effort people are willing to put in.” If students are faced with a task in which they believe that there is a chance of success , engagement and effort will increase. If you are going to use competition, provide choice and work to place kids at a level that challenges them and provides an opportunity for success. Let’s move away from (and beyond) the talk about teaching kids to be good losers. It is a generalized statement and we have no idea what “losing” means to each child. We can teach sportsmanship and respect but, in my experience, I have never succeeded in becoming a “good loser”. 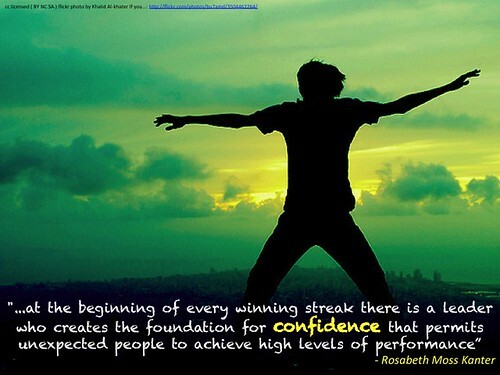 Let’s go deeper and talk about confidence and what happens when we do not meet our goals. Let’s meet kids where they are, provide a safe and challenging environment in which risk taking and making mistakes is encouraged… as long as we use it to become better. I don’t want my kids to become “successful losers” (huh?). I want my kids to grow up and become confident learners. I want them to know their strengths and be aware of their areas they need to work on. I want them to take risks and fall… and when they do, have the support and self-confidence to get back up and try again. I am sure I will continue to make mistakes as a parent and teacher but I will continue to reset and try again. With the aforementioned developed skills and support from family and teachers, I know there is a good chance our kids will achieve more success and eventually lead a worthwhile life… which is defined by them. I would love to hear more ideas and thoughts on this… feel free to share and/or leave a comment below.